The baseball box drill is designed to teach the maximum amount of players, at the same time, the intricacies of the shuffle throw from the second baseman to the shortstop. This type of throw/toss is typically used to begin a double play, but can also be used as an inning ending force out. There are 2 methods of making the shuffle throw/toss. 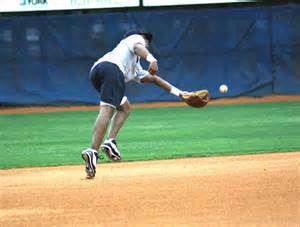 (1) Always try to be moving toward your target (second base) as the forward momentum created helps with the throw. However, there will be times your momentum will be going away, which will require adjustments. (2) When making the underhand throw/toss, bring your arm all the way through the motion. Think of a pitcher. He doesn’t stop his arm after he releases the ball, but follows through with his motion. (1.) You will use this toss when your body is turned or moving away from the target and either won’t have time to shift your feet or are too close for an actual normal throw. When making this toss be sure to have your thumb under the baseball, not only for stability, you shouldn’t palm the ball, but also for accuracy and velocity. Drill Set Up: set the field up same as a typical 4 corner cone drill except using rubber throw down bases instead of cones, separated by @ 30’ to 35’. (1.) Station 1 infielder at each base. (2.) The players should always be moving to their right as this drill is to simulate a toss made by the second baseman. (3.) The coach should yell “start” and the players are to run towards their base and toss the ball to awaiting infielder. (4.) 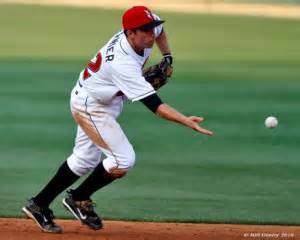 The receiving fielder is to repeat the play to the next infielder. (5.) The drill continues as long as desired. (6.) Increase speed of drill as the players become comfortable with the mechanics, watch to insure each player is following through with their arm motion. Change the drill to a Back Flip Toss. (1.) Drill set up is identical to the underhand toss. 1. Moving towards the base and utilize a back flip. This simulates a ball fielded by the second baseman and the shortstop is already, or nearly already at the base. This quick back flip eliminates any time required to shift feet and reposition the body angle. 2. Moving towards the infield. This simulates a slow to medium speed high hop, which the second baseman must charge in order to either field the ball as quickly as possible or to not be caught by an in-between or short hop. As the fielder will be moving forward a back hand toss is the only option which can be used. 3. From the kneeling position. This simulates a player making a good play on the ball which required him to leave his feet or travel a far distance. This would most likely be a play where the second baseman ranged far to his left and would back flip the ball to whoever was covering first base. Your players have worked hard and executed well. As a reward, but really an increase in skill drill, let the players have fun flipping the ball to one another with their glove, eliminating the bare throwing hand. Method One: Position each player midway between the bases. The coach should stand in the middle of the box and roll balls to the player’s glove side. In other words this is no longer a second base only drill. It’s important to lead the player and not to throw the ball too hard, not at first anyway. Catching a hard hit/thrown ball tends to seat the ball deep in glove and makes it difficult to dislodge it accurately. Method Two: Simply have the player put the ball in his glove and try to accurately toss the ball as he’s running toward the target. These are not fancy drills reserved for professional players. These are drills which should be run from age 13 and up, as these are required skills of a good infielder.